The news of the sudden death of Bill Stafford in a road traffic accident in Clonard Lawns, Dundrum, in the early hours of Sunday morning the 8th November, 09 was received with a great sense of shock and sadness by the entire community. Bill who was only twenty eight years of age, was the eldest son of Liam and Margaret Stafford of Wesley Heights, Dundrum and was one of a family of two boys and one girl. Death is always sad, but when it strikes at one in his prime, having a very promising future, it is particularly poignant. Bill attended Saint Olafâs Primary School, where his mother Margaret was teaching and he received his secondary education in ColÃ¡iste Eoin. He subsequently attended the I.T. College in Tallaght where he studied Marketing and French. He was employed by Accenture and worked for Microsoft in Sandyford for the past five years. He was very committed to his work and had received a number of promotions to attain the position of Management Consultant. He was very proud of the fact that he was the founder member of a football league in his company that is still flourishing. Before the first game played, following his passing a minutes silence was observed in his honour. With his fiancÃ©e Liosa McNamara from Dunlaoghaire, Bill had been living happily in Ballyogan with their two children, Mary and Joe aged twelve and three years respectively. 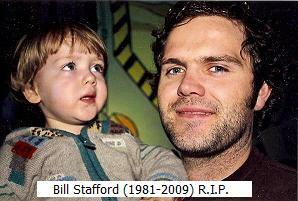 Bill was very devoted to his family and was a responsible and loving father. He was very close to his Mother and had been visiting her recently in Blackrock Clinic. He took his Son in there every Saturday and Sunday. He cycled to work and he also ran about five miles every evening. He exercised in Newpark Sports Centre regularly. He was preparing to run in the Connemara Half Marathon. He had played hurling and football for Naomh Olaf GAA Club up to minor level. In 1996 he was chosen as the clubâs under fifteen Footballer of the Year. Billâs remains were removed from his family home in Wesley Heights to the Church of the Ascension of the Lord, Balally for 11am Mass on Thursday 12th November 09. His youthful friends carried his coffin shoulder high for much of the journey. Despite driving wind and rain members of Naomh Olaf GAA Club formed a Guard of Honour as the remains were received into and later exited the church. The church itself was filled to over-flowing as a huge congregation of mainly young people, united in grief, came to pay their prayerful respect. Father Brendan Purcell, a friend of the family who was the chief celebrant of the Mass, said âMr Staffordâs most enduring quality had been the manner in which he had taken responsibility for his two families, the one he was born into and his family with his fiancÃ©e Liosa. Bishop Brennan of Ferns another friend of the family who took part in the ceremony said, he hoped that the family find some comfort in the support of neighbours, relations and friends. During the service Billâs sister Ruth read a beautiful poem selected for the occasion by her mother Margaret. Among the gifts offered during the offertory procession where a hurley, an Naomh Olaf goalieâs jersey and his son Joe offered his baby book. Following the Mass Billâs remains where taken to Mount Jerome, Haroldâs Cross, for cremation. The family invited everybody present to a reception afterwards in Naomh Olaf GAA club. Billâs death has left a deep void in the lives of the bereaved which will only ease with the passage of time. To his fiancÃ©e Liosa and the coupleâs two children Mary and Joseph, his father Liam, brother Eoin and sister Ruth, his mother Margaret who was gravely ill in hospital and unable to attend the funeral mass, we offer our sincere condolences.